Forged anodized aluminum roller rockers Huge 30mm intake and 24.5mm exhaust valves Stainless Steel Valves (21-4N material) 27mm intake port, 23mm exhaust port Race Camshaft V2-1 (TBW0473 – we can sub cam TBW0577 if preferred) Cam Sprocket The combination of the above features in this Race Head V2 deliver huge power gains over the stock basic OEM cylinder head. 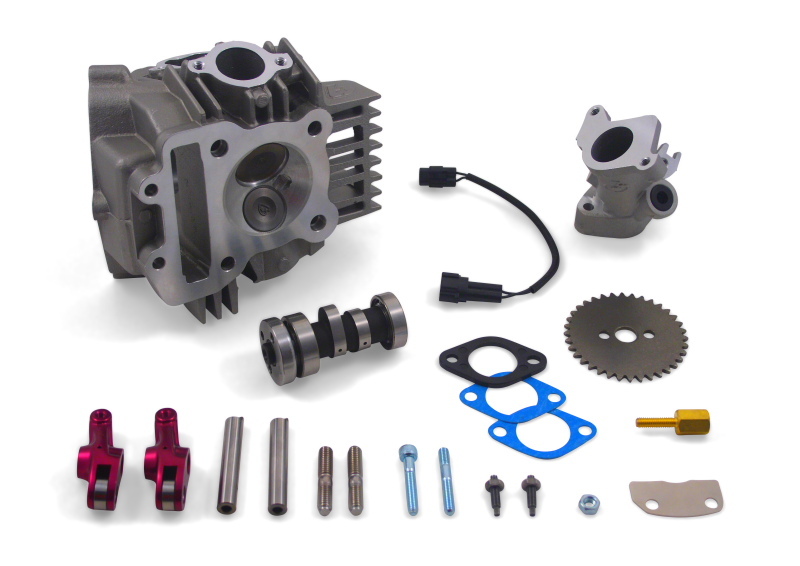 If you have a 165cc or larger bore kit, we recommend going with our TBW0577 camshaft. If you want it, just put a note in the comment section of your order or just email immediately after placing your order to request it. There are no installation instructions, but if you can replace your piston, you can install this kit as the parts are installed in the same manner as the OEM parts. However, its highly recommended that a professional technician install this kit and make sure its tuned properly – An aftermarket fuel controller is required and possibly an autotune will be needed to prevent a lean condition and damage to your engine. A performance exhaust is also recommended as the stock exhaust is restrictive and may cause your engine to run hotter.